Achieving Operational Excellence is an aspiration! Just when you think you are getting close, reality shows there’s always a distance yet to travel. This is why, in the opinion of GEMsoft7, most OE implementations fail. Simply, because their goals are not clearly understood at the outset and the systems adopted to manage expectations assume an unrealistic conclusion – Excellence! Gemsoft7 contends that Operational Excellence needs to be considered a “living thing”, because the business you manage today is not the one you will manage in the months and years ahead. It’s changing all the time and the Operational Management system required to meet these changing challenges must be agile, and be both pro-active and reactive, as circumstances dictate. GEMsoft7 is reframing what Operational Excellence should really mean, in the context of different Industry applications. Their unique step-by-step process is designed not to control the way you work but to help you take control of the work you do, more effectively, efficiently and profitably! Using a consultative approach from the start, GEMsoft7 will help you understand what you need, to meet minimum safety and Legislation protocols; plan and prioritise risk management and opportunity development; whilst identifying the business-critical factors where added value can be achieved. These are core components of any GEmsoft7 system deployment. Come with us, as we walk IN YOUR SHOES to demonstrate our innate understanding of what it takes to deliver an Operational Excellence agenda, mindful that as you get closer to excellence, your new standards will push you father away. It’s an evolving process requiring a full life cycle and utilisation technology. The solution is “Imperative”. This is a high-level audit of your LTO Processes combining in-the -field operational experience of our SMEs with the asset knowledge of your own SMEs. It provides a Maturity Health check across your LTO Processes, with Maturity being the determinant of how well you, as an organisation, are performing each process in the Operations space. We recommend a high-level review as a first step towards a more strategic approach to tackling risk, as it acts as an identifier of the areas requiring a deeper dive. Our recommended, second phase, detailed assessment follows a similar process. The Imperative Insight Review utilises the process maps, KPIs, and definitions that comprise an Imperative LTO process. Fundamental to the assessment is our unique set of over 600 questions which determine your company’s Operational Maturity level (on a basis of 1 – 5) for each LTO Process. The results of the assessment form a report which can also be displayed graphically using a radar chart. 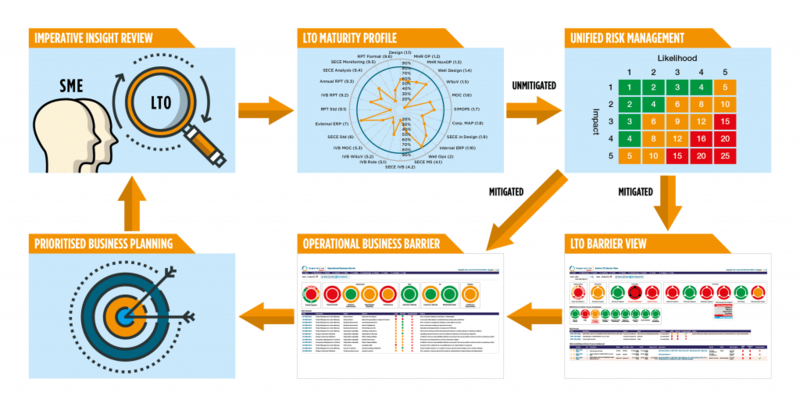 The LTO Barrier view is created by the output of the Imperative Insight Review (high level or detailed assessment), using our Unified Risk Management process. The data is stored in Imperative’s Hub, which manages the allocation, implementation and management of the mitigation actions identified. Furthermore, users can take comfort from the fact that Imperative‘s LTO Barriers go beyond the IOGP and API recommendations, in the following two ways. These barriers enable proper ALARP decisions to be made through the management of Production risks, and also the management of potential impacts to the Environment by Operational and /or Production decisions. Compliance – by monitoring Non-Conformance against company and international standards. Emerging Conditions – enabling visibility of emerging conditions and early assessment, leading to predictive applications of mitigation control measures. Why stop at LTO process management? We don’t! By taking the high level or detailed LTO output and aligning these elements and processes under new categories, a separate suite of barriers is produced to represent your Operational Business Risk. This information is presented as an interactive view, inclusive of other functions in your Operating space already assessed under the LTO Insight Review. While Imperative does not provide a detailed representation of performance of individual functions, it does provide visual clarity of their impact on Operations and vice versa.